The necklace on the left is sold out. The necklace on the right is a full bodied black & white tuxedo cat. 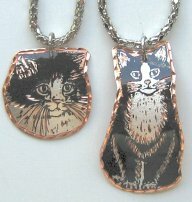 The cat design is silver plated and diamond cut on recycled copper for a multi colored effect. A protective coating is applied to prevent tarnishing. No polishing required. Comes with a 19" chain. This was a special purchase. The cat is 1 6/8" high x 3/4" wide. Boxed.